Is Montessori only for the elite? Maria Montessori, Mexico, Afghanistan, Thai/Burma border, Afghanistan, Haiti, Torres Strait, Australia, Kenya, Australia. There are many projects around the world working with our poorest and most disadvantaged children. Further information can be found at Montessori Around the World and Educateurs Sans Frontieres. What about in your neighbourhood? Is there a private school, a charter school, a public school? The school my children attend is private but it was founded by a small group of parents who recognised a need for a Montessori school in our area. Yes, it was founded by parents. In my city we also have a free (with a voluntary fee of $50-60 per term) Montessori school for children which covers kindergarten to preschool. Is Parenting More Important Than School? There are definitely days that I feel overwhelmed by blogging (yesterday!) but mostly I'm in love with the process. I'm in love, excited and inspired by what I find in my in-box. Amazed by the enthusiasm for parenting and teaching that surrounds me. A big thank you to Open Colleges for sharing Parenting More Important Than School: The Effect of Parental Involvement In Academic Achievement. You can see an enlarged version of the graphic here. While I'm convinced that it doesn't tell you any thing new, I found it interesting. The take home message for me isn't about a parent's income or education levels, the message for me is to stay involved. And for schools and teachers the message must be to engage parents. Perhaps the greater message is that we, as parents, are more important than we think. Finally I have updated our what we are reading page. As usual I've only highlighted the best of what we are reading. I want to apologise to the many readers and even sponsors who have emailed me over the last few months. Personally and as a family we have been through a difficult time. My husband returned from a seven month deployment and we are adjusting to a different kind of normal. My screen time has been limited and I have been posting at a reduced rate (I'm sure you have noticed) in order to address the many requests and emails in my in-box. You, the readers of this blog are a priority and it saddens me that many of you have written to me and have not received a response. I'm getting there and will continue to post at a reduced frequency until all emails are responded to. I also wanted to share two posts by fellow Australians. You can read about Montessori in Anna's home here and Steph's home here. Both posts have beautiful photographs. Also a shout out to one of my favourite Aussie Montessori blogs Racheous. I hope you enjoy! I love working with the boys and showing them how things are made. Often projects stem from Caspar's questions, often from something he has seen or read in a book. Always from his natural curiosity. Over the weekend we made our own recycled paper. It was fun, wet and pretty messy. It's a wonderful project because in the end Caspar has his own paper to use and share with others. Together we spent many hours tearing waste paper into little pieces. Then we soaked the paper for a couple of hours. We put the paper with water into the blender. Then blended until happy with the consistency. We weren't too fussy, certainly keep on blending for finer particles. Then poured the paper pulp into a big tub and used the deckle to form a consistent layer. No photos of this stage because I didn't want to cover my camera with lovely paper pulp. Did I mention messy? Then transferred the paper onto cotton (must be a natural fabric) and compressed to dry. Beautiful handmade, I made-it-myself paper! Before I had children I dreamt of days like this. I longed for the everyday moments. Sure I don't care much for the washing and cleaning but it's made so much easier with a little one happily playing nearby. I am blessed for the normalcy that is now back in our lives. I am grateful for uneventfulness, appreciative of the everyday. It's Friday night here, I hope you have a lovely weekend. I thought I would show you this transferring water activity Otis used today. I've written before how Montessori teaches gentleness, this is another activity which brings out the best in Otis. He needs concentration, care and patience to transfer the (coloured) water. This is an easy activity to put together and when the child is older the dropper has so many more uses. When we have an activity like this on our shelves we don't keep the water in it. Just the bowls and dropper are kept on the tray. If Otis wants to do the activity he will come to me and ask for the water. This activity reminds me a lot of transferring water with a baster. I know that I cannot really 'make' my children do anything. It's up to them to decide what they do and I just hope that I'm raising them well enough that they make the right decisions. Just as I cannot make them eat I cannot make them learn. It's why I feel it's so important we consider the materials we make available and the activities we present. It's why Montessori classrooms have so many shelves. It's why in Montessori each child is doing their own work. It's why Otis walks into the study, picks up a tray, takes it to his table and starts working. I know if I presented him with that exact tray and asked him to do the activity it's likely he wouldn't want to do it. While I've been able to see first hand the love of learning in a young child I had my doubts if it exists in older children. I've had doubts about how well Montessori works for Cycle Three or 9-12 year old children. What would they do if they had a choice? Well it turns out they choose to learn too. Not because they have to, it's because they have and always have had the choice when and what to learn. So often I'm asked how this works in our home. It's simple and I really don't think about it much. I love looking for and finding fun and attractive developmentally appropriate materials. I make those materials (mostly) freely accessible to the children and they choose when and what to use. There is no 'Montessori time', there is no 'tot school', there is no list, there is no schedule. There is no mandate for learning - the children choose. With two children at home on a cold wintery day it was nice to be surrounded by colour and creativity. I surprised the boys with these colour pegs. It's an activity suitable for both age groups. Great for the pincer grip, fine motor skills and colour recognition. Threading to make paper straw necklaces. Nature printing which worked beautifully. And Otis had fun painting with the rollers. I hope your Monday was as colourful and carefree as ours. These Sensory Bean Bags are based on the same idea as the Fabric Box. My thinking was that bean bags would be more versatile and with some weight to them be more appealing to my children. I made them using fabric from around the house, scraps and old or torn clothing and linens. Unfortunately I couldn't find silk or wool but it would be nice to add them to this collection. Each fabric and therefore each bean bag has a distinctly different texture so the selection of fabrics here is important. Otis preferred to match them visually although he loved feeling them and brushing them against his face. Using these demonstrated Otis's strong need for order, he loved getting them out and putting them away more than anything. Caspar's response was a little more interesting. We put one set in a basket and the other in the mystery bag. Caspar selected one bag from the basket and without looking (using touch only) found the matching bag. This activity could be presented with the child using a blindfold (as the Fabric Box often is). If using a blindfold or the mystery bag with Otis I would start with three bags only and use those with the greatest contrast in texture. This was a really affordable activity to make. I used materials from around the house and the sewing was straight forward. These bean bags are now sitting on a shelf in the study. A nice reminder to me to DIY materials more often. I wanted to show you the latest book written by my dear friend Eve. 100 activitès d'éveil Montessori (100 Montessori Early Learning Activities) from 18 months. It is in French and in Eve's beautiful style. Each activity is very doable using basic homemade or easy to find materials. I'm also slightly biased because you may also find one or two pictures of Otis in. Not only is Eve a Montessori teacher, she is also a parent of two gorgeous girls, and this I think makes her most qualified to write this book. Some of the photographs were taken in her classroom but many are from her home which makes it so, so lovely and warm. I know you will like it (more so if you read French). I really hope that consideration is given to publishing this in English. 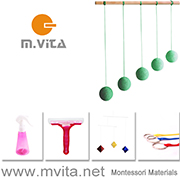 What I didn't know is that Eve has also produced a set of Montessori math materials Mes chiffres Montessori (My Numbers Montessori) from three years. These are a little too old for Otis so I used them myself. They are lovely. The numbers on the green card are lightly textured. The puzzle cards are perfect as is the control of error that a child cannot incorrectly match the numeral to the number of butterflies. This set also comes with a booklet describing other math related materials. They are really good quality and I will be using them with Otis once he is ready. P.S. The only numeral that is very different in this set is the seven. I don't know how or why it started but I have always written seven this way! Perhaps Otis will follow. What is happening in Montessori Blogland? The pictures in this post make me so happy I could pass out. If you are French or French speaking check back tomorrow as I have some beautiful materials to show you. Lori has given Montessori MOMents a make-over and it looks amazing. Congratulations Lori! Sara has written a post about Henry's Montessori activities. Nicole gives us a tour of her Henry's Toddler Room. 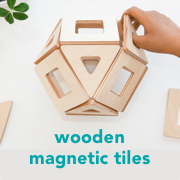 If you liked Montessori Number Work and Letter Work then you might be interested in Montessori Shape Work by the fantastic and innovative team at Baan Dek Montessori. I remember reading Itty Bitty Love years ago when Anne was a teacher. Now she is a parent too and her site is a fantastic resource especially for infants and early toddlerhood, here is E's Montessori Nursery. The best thing about learning at home is the flexibility. It's easy for us to go from looking to cutting, cooking and eating. Today we took a basket of root vegetables into the study to give us some time to sit, relax and comfortably explore. This is also a wonderful language lesson as I gave him, and he repeated, the name of each vegetable. Then into the kitchen to make vegetable chips. Tossed in olive oil with seasoning and baked until brown and crispy. A tasty and nutritious snack and a wonderful learning experience.